Felicitations to Rihanna the Rhinoceros, who has given birth to her second calf: A beautiful baby girl, at the Ramat Gan Safari Park. 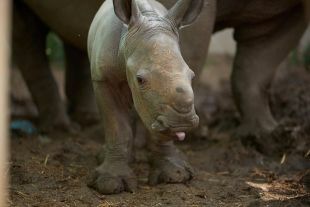 The wee white rhino (also known as square-lipped) weighed about 50 kilos at birth, which is more than some human adults. That is a rough estimate, based on experience and observation, because the Safari keepers don’t barge into the rhino maternity enclosure to grab the kids and glue them to a scale. Her birth, about two and a half weeks ago, was not a surprise. Based on observation of Rihanna mating with the dominant male, Atari, and based on an estimated gestation of 18 months, she had been expected to give birth in January. Okay, they were about a month or two off. The keepers were tipped off by noticing that Rihanna’s first calf, a 2-year-old named Rami, was off moping by himself, which is not typical for a young rhino. Where was his mother? Busy. 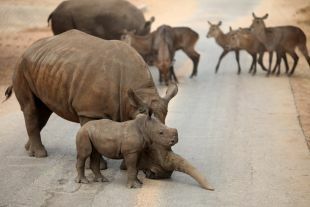 The baby was born with only a bud where its horn will grow, as rhinos are. Upon being born, the wee one fell down, got up, stood, then staggered around the birthing enclosure a bit to acclimatize to life. “Once she was taken to the open park the other day, the baby started to race around madly,” says Safari spokeswoman Sagit Horowitz. The new rhino hasn’t been named yet. As has become its custom, the Safari Park is allowing the public to weigh in through the Hebrew online daily Ynet, with some constraints – the name should begin with the letter R.
Atari and Rihanna, 12, already had Rami. Atari is also presumably the father of the new calf, on the grounds that the other male rhinos in the Safari’s 14-rhino herd (including the baby) are too young and callow, Horowitz explains. “They can’t get near the females,” she says. The Safari’s rhinos live with other herbivorous African animals in a spacious open park in Ramat Gan, which people can drive through. From the highway one can see the odd set of horns or giraffe over the fence. The lovely Rihanna is part of the Safari’s breeding program, which the park claims is more prolific than the rhino breeding programs in Europe. “We brought two females from a nature reserve in South Africa: Rihanna and Keren Peles,” Horowitz says. Each has produced two offspring so far. A third female, Tanda, is older and has five offspring. The white rhino species is extremely endangered and the zoo breeding and exchange programs could be crucial to the species’ survival.